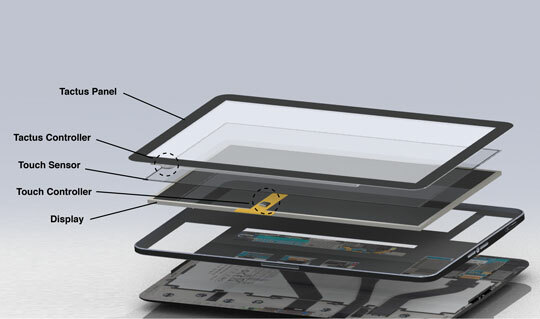 Tactus Technology Tackles Touchscreen Troubles! We know, you love your smartphone. The touch screens are getting better and better for tablets and the like, but do you really love the DPI (dots per inch) that you have to deal with on your smartphone surface? Remember when the iPhone had the terrible propensity of not selecting what your fingers were adamantly touching-did you blame the phone capabilities, or your fingers-and what do you do now? Do you accept the newest smartphone models, embracing and commodifying them for their cutting edge usability? I’m sure you do, and you’re not the only one-in fact, you’re one of a billion users. The folks at Tactus Technology know how you really feel. They recognize what’s lost in the translation between user and interface on the touch screens we say we love so much that really ends up leaving a lot to be desired from the typical user-while excluding the blind, the visually impaired, the elderly, and the people without the mandatory fine motor skills it takes to operate a touch screen. Tactus utilizes the efforts of physics, chemistry, and biology through microfluidics to harness the surface tension of the physical layer that is trademarked, and patented, by Tactus themselves as the first deformable tactile surface. In less than one second, buttons rise out of the Tactus panel, allowing for near seamless implementation into the user interface as the need arises, and even offers a toggle to turn its tactile features on and off. It can be easily integrated with touch screens on the market today, replacing the once coveted touch screen of your smartphone with a Tactus panel, sensor, and controller. The developer can instantiate an array of button interfaces with this technology, including sliders (similar to analog) for gaming, impressed buttons, even vertical and horizontal finger guides for simple assistance. This innovative technology offered by Tactus will change user interfaces as we know it! I imagine it will open new avenues for the tech markets while improving the speed, efficiency, and enthusiasm of users.